Video performance Industry leading resolutions of 1600x1200 are achievable at 200m (650ft) and 1280x1024 at 300m (1000ft). Video compensation The AdderLink X2-Silver applies a high level of signal compensation that allows for a greatly increased range of very smooth and fine adjustments. Emulated DDC Unless an extender actively supports DDC some well-known high performance video cards cannot be used at high resolutions. 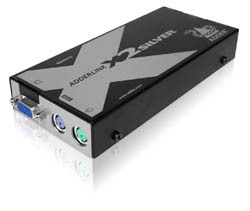 The AdderLink X2-Silver fully supports DDC. Brightness control The AdderLink X2-Silver offers its own brightness correction to ensure that the image is crisp, clear and bright, regardless of the distance. Rack options Both transmitter and receiver units can be used stand-alone or up to 16 (7 X2-Silver Dual) units can be mounted into a 2U chassis. 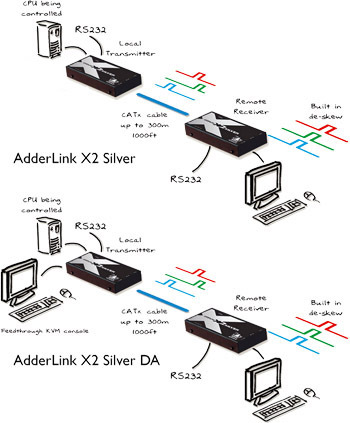 Integrated DeSkew The AdderLink X2-Silver has integrated skew correction with a 300MHz bandwidth, meaning that it is more than powerful enough to counteract the negative effects of the skew. Computer connection: 1 x 25-way female connector (cable supplied). CATx: 1 x RJ45 connector. Serial: DB9.